Replenishment is just strange. In naxx days I used to get a lot more ticks then other classes even with multiple sources. 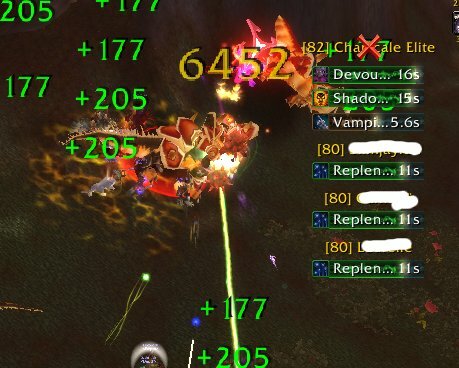 A few times in icc, I have just not had it bufffed to the point I am checking the raid comp to make sure we it. Paladin replenishment is a very good source, they tend to have a high uptime on the boss outside of fights like blood princes and the often open with judgement proccing replenishment immediately if they have been off a boss. Their was some testing done in beta. Generally in a 10 man raid with a single source your fine. Ideally with 2 sources in a 25 man raid you should also be fine. But the result of the testing in beta showed it was not quite so easy. When a second replenishment source procs from what I remember it does not simply say these 10 people have the replenishment buff apply it to the next 10 lowest. That sounds so strange. The only thing I can think of is that part of the tooltip for mage replenishment that reads “This effect can only occur once every six seconds.” I believe this is true for all versions of the buff. If you had three people bringing replenishment, it’s possible that you’re proccing it back to back with them. I can picture this happening in the beginning of a fight, especially if you have two paladins who run in guns blazing, judging to open their rotation. By the time you build up to proccing yours, there might be only a couple of characters left who hadn’t gotten the buff from the first two procs, and if you’re using MB within six seconds of a judgment, it would be too soon to refresh it on the rest of the raid. I’m not sure if this is what is happening, but its a possible explanation. that six secs would make sence, I haven’t had to worry about it much because it had never been an issue, and its not likely that I would proc it more then once in 6 sec anyway, but multi sources would. I didn’t want to paste the whole thing, so that was a part of the snippet. Now another snippet. Albeit, this was only one specific parse, but it was over the entire ~4 minutes for your guild. I didn’t look to deeply into the logs. From the looks of it though, your replenishment went to the two holy paladins. So I’d say yours was the most important, but it’s also indicative since the two holy pallies likely have the largest mana pool, at the start of a fight they would be last in line to receive replenishment. 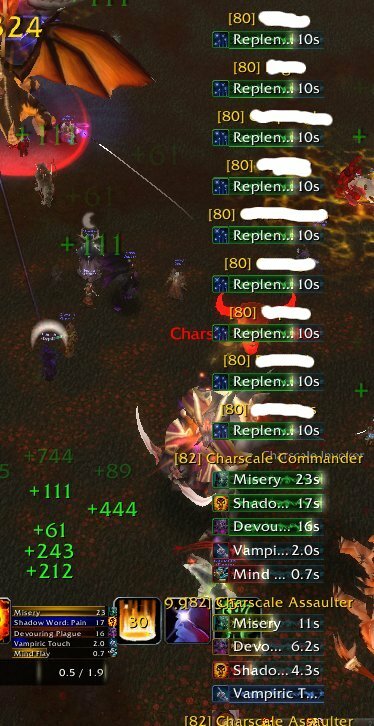 It looks like Ret Pally one got 6 people, Ret Pally two got 10 people, and you got the remaining 2 people. I suspect, Ret Pally one also got 4 pets. I figured that the other two sources would be procing it – but I couldn’t work out why given that it overrides( refreshes) on people, that my proc of the buff would only hit a few people, which the 6 sec rule makes sence, and I also feel silly worrying about things that are gonna change with Cata 😦 I feel like I’m asking why months and months too late, but cheers for that. I’ve never had to look at replenishment in such intimate detail before, and its been quite interesting. I thought 1 person providing replenishment would cover 10 people pretty much non stop. 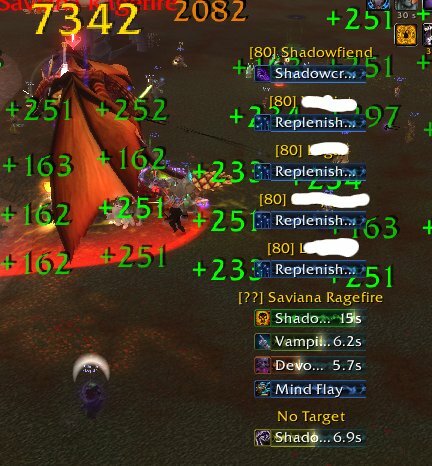 So if you’ve buffed a few targets with replenishment and you proc a new buff doesn’t it refresh the buff timer and give it to some more worthy receipients? Factoring in that 2 other players are proccing it I guess there are times when every single raid member that has mana could have replenlishment. And perhaps only three raid members didn’t and that’s when you captured that you only buffed three at one time. I think it’s just the overlap timing of when the procs occur?